Step 1 Preheat oven to 350°. In a large bowl, combine the first 5 dry ingredients. In a separate bowl, combine the remainder of the wet ingredients. Step 2 Add oat mixture to wet ingredients, and gently stir until fully combined. Coat a round cake/pie pan with non-stick spray. Pour the mixture into the pan, and spread it evenly. Step 3 Bake for 30 minutes or until golden brown and set. Let cool, remove, and cut into 5 pie wedges. 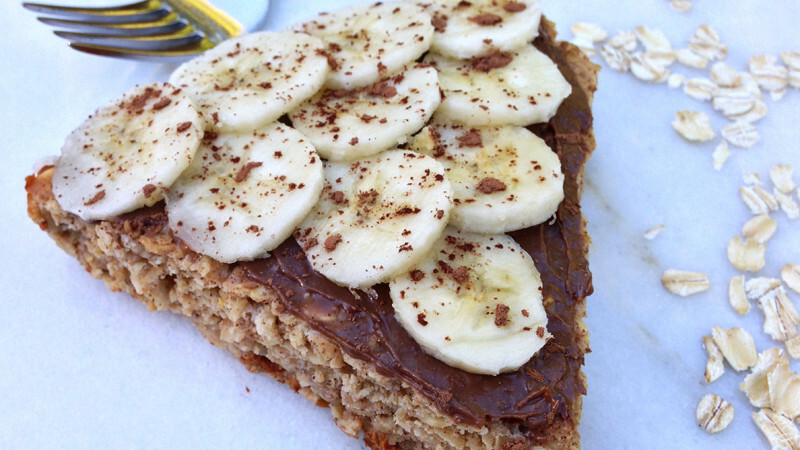 Top with chocolate peanut butter spread and sliced bananas. Refrigerate the extras until ready to eat. Feel like you’re eating dessert for breakfast (without all the extra calories and fat) with this perfectly sweet—not to mention completely satisfying—baked oatmeal pie.